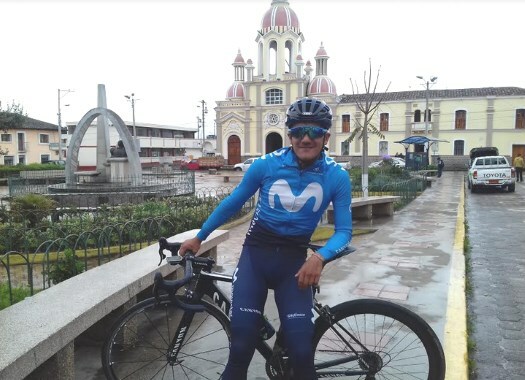 Richard Carapaz (Movistar) has won the eighth stage of the Giro d'Italia. The Ecuadorian launched an attack in the last kilometres and could take a historic solo victory for Ecuador. The eighth day of racing was also the second stage with a summit finish. The 209-kilometre route took the riders between Praia a Mare and Montevergine di Mercogliano. The escape of the day was formed by Matteo Montaguti (AG2R La Mondiale), Rodolfo Torres (Androni-Giocattoli), Davide Villella (Astana), Matej Mohoric (Bahrain-Merida), Tosh Van Der Sande (Lotto-Fix-All) and Koen Bouwman (LottoNL-Jumbo) and Jan Polanc (UAE Team Emirates). The breakaway got an advantage of more than six minutes over the peloton. During the last climb, the front group got diminished until only Bouwman, Mohoric, Montaguti and Polanc remained. With 3.7 kilometres to go, Bouwman attacked from the front group and created a considerable gap with the rest. Meanwhile, in the peloton, there was a moment of panic for Sky as Chris Froome was held up in a crash involving Wout Poels. But the British team reacted well and brought its leader back to the front of the peloton. Shortly after, Sky took charge of setting the rhythm for the pack. With 1.3 kilometres to go, Richard Carapaz (Movistar) attacked from the peloton following the move of Mikel Cherel (AG2R La Mondiale). Soon Carapaz caught and overtook Bouwman and continued on his own to take the stage victory. Behind in the pack, Thibaut Pinot (Groupama-FDJ) attacked in the last metres and was followed and overtaken by Davide Formolo (Bora-hansgrohe), to take the second and third place of the stage, respectively. The rest of the favourites arrived at seven seconds from Carapaz. Simon Yates tops the GC for another day.